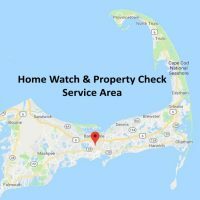 We provide home watch and property check patrol services with real-time reporting and notifications in all the towns on Cape Cod, as well as Buzzard’s Bay and some parts of Wareham just off Cape. Call us at 774-383-2030 or email us anytime 24/7 to discuss your Cape Cod home watch or property check needs. What’s the difference between the home watch and property check patrol services? For non-winterized vacant homes with active mechanical systems where the heat is left on with interior systems and conditions that need to be monitored over the off season. Optional installation and monitoring of low temperature/freeze alarms is also available. Requires a means of entry, alarm codes, etc. For winterized vacant houses, cottages, cabins, campers, etc with inactive mechanical systems and plumbing drained, For assessments of potential problems, reported issues, storm damage, security breach, trespassing and vagrancy deterrence, or for verification of completion/progress for services contracted with third-parties. Does not require a means of entry. Vacant vacation houses, cottages and other properties are typically regularly checked once a week, or every other week during the off-season according to the property owner’s needs and/or any applicable insurance policy requirements related to property vacancy. ** Additional or more frequent reports due to weather conditions and power outages are sometimes necessary. *** Our home watch and property check patrol services are also available as a no contract, on call or on demand service. Please call us at 774-383-2030 to discuss your vacant property needs. We also provide priority dispatch alarm and emergency call out response and caretaker services for residential clients and can respond immediately to your property on your behalf. Real-Time Reports include detailed photos and a complete checklist for our accountability, your insurance records and your peace of mind. 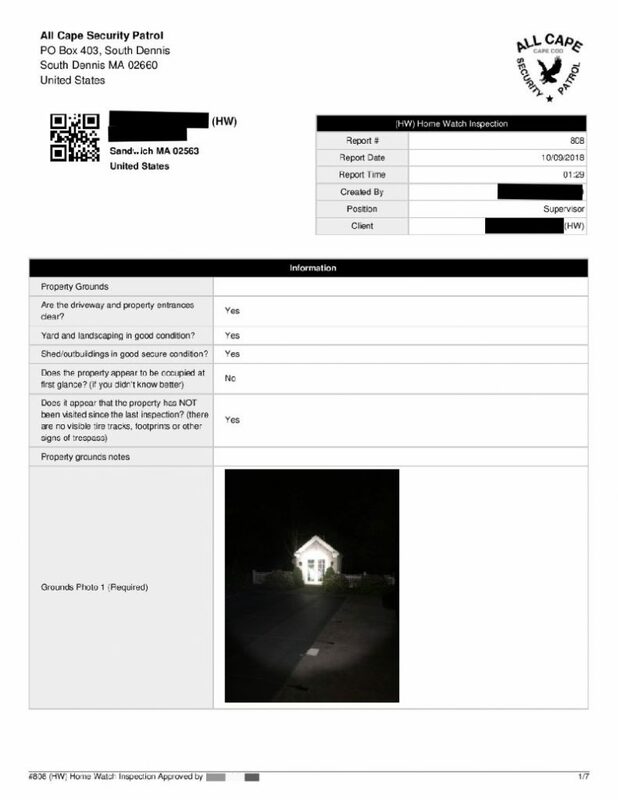 Optional text message notifications that indicate we were on the property and a report was submitted to your email. Professional security industry reporting and records keeping creates a verifiable history of property conditions should you ever need to file an insurance claim. 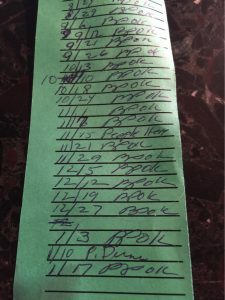 Because we are are a security patrol company and serve numerous commercial and residential clients, our detailed reporting and records keeping is unmatched locally. Our home watch and property check services are reported with our security patrol software and includes GPS tracking verification, property condition checklists and detailed images that accurately document the current conditions at your property and notify you in real time. Our professional security industry level of service can help you avoid risk. Low level, non-existent, or unverifiable reporting can hinder your efforts if you need to file a disaster claim. Trusting an unlicensed provider like a handyman with keys to your vacant home is risky and is also against MA State law. If something happens to your property while you’re away, this may be all your insurance company needs to deny your claim. Why take chances with your big investment? If you own property on Cape Cod, you might need us in a pinch. We are open 24/7/365. Call us anytime (774) 383-2030. 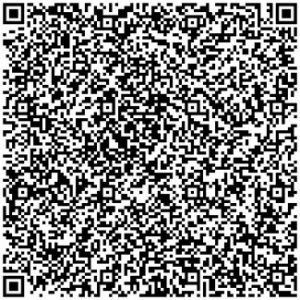 Scan the image below with your phone’s camera, or if on you are on a phone or tablet right now, try pressing on the the image below and follow the prompts to add us to your contacts. 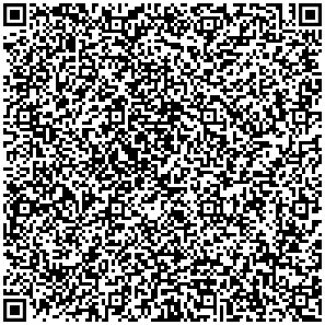 Our contact includes our phone number, mailing address, email address and website contact information. On Demand and Emergency Services are also available any time 24/7/365. Year Round Caretaker and Key Holding services for alarm response, lockouts and supervised contractor access. Call (774) 383-2030 anytime 24/7, or email us right now! 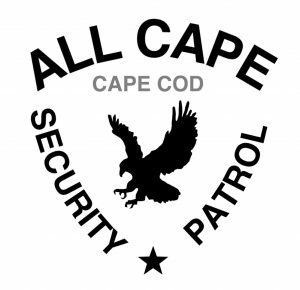 All Cape Security Patrol provides private security patrol, residential home watch and property check services to all the towns and villages on Cape Cod. Call (774) 383-2030 anytime 24/7, or email us right now to find out why All Cape Security Patrol should be your trusted local security patrol and home watch company.